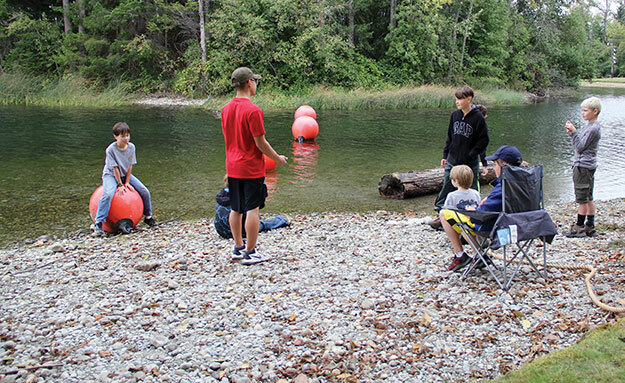 Joint Base Lewis-McChord's (JBLM) Boy Scout Troop 62 gives military kids the chance to get outside, learn skills and build relationships. Rain or shine, these scouts camp. Away from screens and couches, they set up tents, make campfires and eat s'mores. Troop 62 joined with Cub Scout Packs 461 and 462 for a two-night campout last fall on the shores of American Lake. Along with free time and fun, they hauled logs out of the lake and cleaned up the beach. They also broke into groups where senior scouts taught fire safety, knots and first aid. It was clear they were having a great time. It was also clear that, for these scouts, community is just as important as camping. They worked together and learned from each other. The weekend's activities were led by Senior Troop Leader Elliot Lee. Of his Scouting experience, he said, "I first joined Scouts for the camping, but now my favorite part is meeting new people. I also really like working with the younger scouts. We're a military children's troop so we're really good at transitioning scouts in and out. We're good at making as many memories as possible before we have to move." Troop 62 meets Wednesdays at 7 p.m. at the Scout Hut on North Fort. Each week's agenda varies. They may work on Scout skills such as fire building, cooking or knot tying, or take part in a Scout-planned activity like bowling, indoor rock climbing or swimming. If you remember the merit badges from your youth, you'll be glad to know they're still a big deal. "We use merit badges for rank advancement and to teach scouts about themselves, their interests, and how they interact with the world," said Scoutmaster Shawn Anderson. "Scouting is an exciting adventure that builds character, leadership and life skills. I've enjoyed watching scouts become strong, confident leaders who help new scouts in their journey." In addition to weekly meetings and monthly campouts, scouts also plan special events throughout the year. Anderson says his troop will be busy this year. Just a few activities in the cue are indoor skydiving, scuba diving, hiking, canoeing and zip-lining. They're also working on a wilderness survival campout and a visit to the LeMay Car Museum. Their biggest event will be the Centennial Celebration in March, which will feature a Scouting Skill Challenge and barbecue. While Scouts take the lead on planning and running activities, parent volunteers are needed. Parents can serve as committee members and assistant scoutmasters -- or teach skills and chaperone campouts. Scouts and volunteers can expect a time commitment of two to four hours a week and one to two weekends a month. Scouts often dedicate more time if they're working on merit badges. To learn more about Troop 62 (ages 11-17), visit facebook.com/Troop62JBLM. If your kids are in grades kindergarten through fifth, check out JBLM Cub Scout Packs 461 and 462 at facebook.com/JBLMPack461 and facebook.com/JBLMPack462. You can also get a complete list of units in your area and apply on-line at beascout.org.